Representing MdCV FFA at the U.S. Capitol, Grace Bradley, Kaelin Criqui and Bayleigh Lacey. WASHINGTON, D.C. – Marais des Cygnes Valley FFA members Grace Bradley, Bayleigh Lacey and Kaelin Criqui, along with other FFA members from throughout the country, converged on Washington, D.C., this past summer to analyze their personal skills and interests, develop leadership skills, and create a meaningful community service plan that will make a difference in their home communities. More than 2,100 students participated in the 2018 Washington Leadership Conference, the second-largest student experience that the National FFA Organization hosts each year. MdCV FFA members attended from June 12 to 17, 2018. MdCV FFA members spent a week under the guidance of professionals, counselors, and FFA staff members. In workshops, seminars and small groups, FFA members focused on identifying and developing their personal strengths and goals while undergoing comprehensive leadership training that will help them guide their local FFA chapters. Students also analyzed the needs of their communities back home, developed a wide-range and high-impact community service initiatives and implemented their plan with the help of their FFA chapter upon return home. 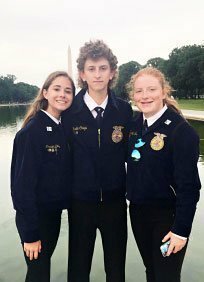 During their time in D.C., FFA members Bradley, Lacey and Criqui also experienced the history of the nation’s capital, touring landmarks including the Washington Monument, War Memorial, the National Mall, Arlington National Cemetery and the U.S. Capitol, among others. When asked about their most memorable WLC experience Bradley said, “The night tours of the memorials and monuments was the most memorable. It was so cool to see everything where some of the biggest strides in U.S. history were made. Viewing these monuments is an experience that every U.S. citizen should witness”. The 2018 Washington Leadership Conference is sponsored through the National FFA Foundation. The National FFA Organization provides leadership, personal growth, and career success training through agricultural education to 629,367 student members who belong to one of 7,757 local FFA chapters throughout the U.S., Puerto Rico and the Virgin Islands. Information and photo thanks to Danny Rice, MdCV FFA advisor.